Renowned for its comprehensive coverage, exceptional illustrations, and clear instructions, Patternmaking for Fashion Design offers detailed yet easy-to-understand explanations of the essence of patternmaking. -Updated with modern, cutting-edge sketches and designs. -DVD included in the back of the book. -Ribbing added to the knit section of Chapter 27. -More materials on children's wear and swim wear. -Complete coverage of the three steps of design patterns: dart manipulation, added fullness, and contouring. An amazing textbook! Everything you want and need! Great for Starters, Advanced Pattern Drafters, Teachers and Students! Easy to read and very organized! I recommend this textbook to anyone who is wanting to learn pattern drafting or have a reference to pattern drafting techniques! The textbook I ordered was exactly the same as what they had listed. I am very pleased with them and will order other books, if possible, in the future. 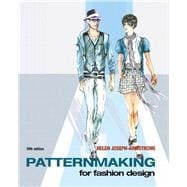 Patternmaking For Fashion Design: 5 out of 5 stars based on 1 user reviews.